The post How to Assess Your Emergency Situation with Pets by Denise LeBeau appeared first on Dogster. Copying over entire articles infringes on copyright laws. You may not be aware of it, but all of these articles were assigned, contracted and paid for, so they aren’t considered public domain. However, we appreciate that you like the article and would love it if you continued sharing just the first paragraph of an article, then linking out to the rest of the piece on Dogster.com. There have been more devastating natural disasters across the country than ever before — and they’re not stopping anytime soon. From fires in the West to hurricanes in the East and other emergency situations like tornadoes popping up in between, Americans are constantly on high alert. How to keep the whole family safe — including pets — is at the forefront of many people’s minds. Being prepared to evacuate with your dog or your cat is the first step. Assessing your situation is the next critical key to your family’s safety and survival. Here’s how to assess your emergency situation with pets and make lifesaving choices. Have a plan for evacuating with your dogs in place beforehand. Photography by humonia/Thinkstock. There are more sheltering options than ever before. During Hurricane Katrina, many people did not evacuate because they didn’t want to leave their pets behind. After Katrina, Congress passed the PETS Act to ensure that state and local emergency plans include companion animals. Unfortunately, pets still aren’t welcomed at American Red Cross shelters. However, proper shelters can be found for pets via pet-centric websites. BringFido is dedicated to pet-friendly accommodations for travelers with pets and it’s an indispensable resource whether you’re moving across the country or going on a holiday. BringFido is providing lifesaving shelter resources for emergency situations, like its list of pet-friendly evacuation shelters for Hurricane Irma. Authorities are getting savvier at predicting when and where a hurricane (and other natural disasters) will impact communities. Receiving that information in advance allows for maximum safety. When disaster is coming your way, authorities will determine evacuation procedures, based on potential threats, which are assigned zones. Finding out which zone your home is located in, and what is predicated for your neighborhood, is important. For Hurricane Irma, Florida officials put all the information regarding zones and evacuation routes up on the web. The website for the State Emergency Response Commissions will direct you toward your state’s specific information. Ready.gov, a service dedicated to providing emergency alerts, will help keep you abreast of the situation and provide real-time resources. It has emergency-related information for every situation from bio-terrorism to tornadoes to power outages and beyond. Being informed will help you make safer choices for you and your pet. Even if you plan to stay, transport any pets to a trusted relative or friend’s home well out of any danger zones. Don’t have a place to take your pet? Adopt-A-Pet created an online service, Foster A Hurricane Pet, where pet guardians can find fosters for their furry loved ones. These are two choices to ensure your pets are as safe as possible in an emergency situation. Some emergency situations don’t come with weather updates or evacuation routes. Fires, chemical spills and more could happen at any time. 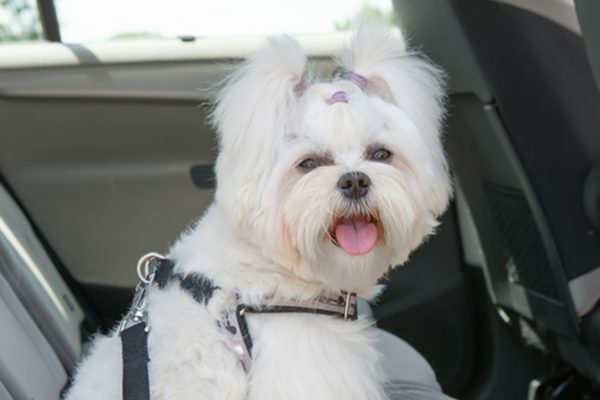 Always be prepared by having items like dog leashes and extra food and water ready to go. Practice your evacuation plan with your dog so you can both make it out of the emergency situation safely and efficiently. Check out our complete emergency preparedness checklist here. While you should exhaust every option before leaving your pet behind, sometimes the unexpected happens. Storm tracking experts can be wrong. Plans can go awry. Funds can be cut short. In the event that you must leave without your pets as a disaster approaches, here are some best practices. It should go without saying, that tethering your dog or crating your cat is out of the question. “If you do have to leave your dog or cat behind, be sure and leave the toilet lid open in your house, so your pet has water,” says Cathy Scott, investigative journalist and author of Pawprints of Katrina: Pets Saved and Lessons Learned. “If it’s a fire that’s approaching and you can’t take your pet with you, leave the doors open so they are able to escape should the house catch fire.” Leave ample amounts of food and water at the highest ground possible (that your pet can reach) if flooding is a possibility. Also, spray paint the number of dogs and cats on the outside of your structure to alert rescue teams to their presence. Seek out any animal rescue organizations that may be making recovery rounds, tell them that you were forced to leave your pet behind and provide information on your pet and his whereabouts. Get back to your home as soon as it’s safe. Working with CERT (Community Emergency Rescue Teams) and local animal-welfare agencies will reunite you with your pets quickly. While it is impossible to predict the future, you have the power to ensure your pets are safe during any type of emergency. The key is to properly assess your emergency situation with pets and have a solid, proactive plan in place. Thumbnail: Photography by pixbull / Shutterstock.